Earlier this month, the Mills College music department dedicated an entire concert to the music of Lindsay Cooper. It was an extraordinary event, not only for bringing her work together in one setting, but for the cast of talented musicians who made up the ensemble. Lindsay Cooper is perhaps best known for work with the experimental rock group Henry Cow, but her musical career spans a variety of other styles and disciplines before and after. And while her instrumental first love remained the bassoon, she also played many other wind instruments, and had a very distinctive haunting voice that could be heard on many of Henry Cow’s recordings. 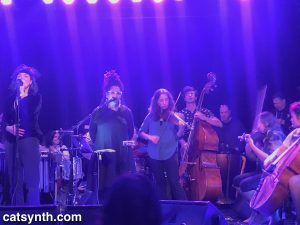 Her compositions, including her time with the band and her later projects including News from Babel up to her retirement while suffering from MS, are not often heard in concert calls. The concert on this evening was a step towards rectifying that. Musically the concert was a high-speed tour through Cooper’s music. Many of the pieces were short an energetic. 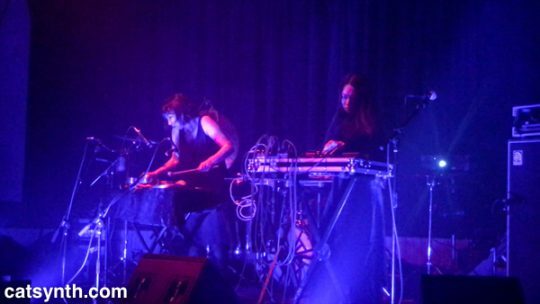 Some carried the energy and rhythm of experimental rock, with driving lines on keyboard, guitar and drums; others were quite abstract with longer sounds. There was an anxiety and restlessness that permeated the music, with a need to move forward, sometimes almost tumbling. It was also full of intricate details and contrapuntal lines, which were brought out especially in the horn parts. There were moments which had the grand style and fast-moving details of a classic film score, particularly reminiscent of a closing “The End” from a film for which the ending may not have felt quite so final. 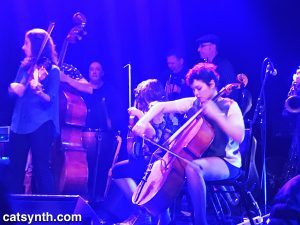 The main ensemble featured two of Cooper’s longtime collaborators, Fred Frith (guitar, keyboard) and Zeena Parkins (harp). 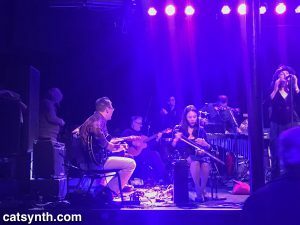 Rounding out the ensemble was a group of familiar faces in Steve Admans, Rachel Austin, Beth Custer, Evelyn Davis, Jordan Glenn, Jason Hoopes, Kasy Knudsen, Kate McLoughlin, Emily Packard, and Andy Strain; with Miles Boisen on sound. The performances felt easy and flawless (no doubt the result of countless rehearsals), and with a relatively light texture despite the ensemble’s size. The concert’s sole departure was a performance by the Rova Sax Quartet of Face in the Crowd, a piece they had commissioned from Cooper in 1996. Judging from her biography and the date, it may have been one of her last compositions. 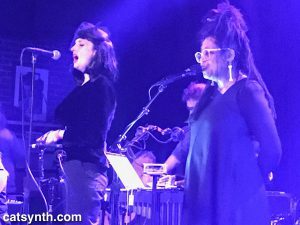 In addition to the performers on stage, the audience too was a cast of familiar faces and influential musicians from the Bay Area music scene. It seems that Lindsay Cooper had quite an influence on artists her; and thus this was a concert not to be missed. I am glad that I was able to be there. 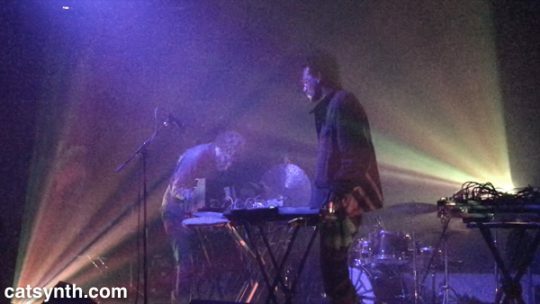 A couple of weeks ago, Surplus 1980 joined the Fred Frith Trio at the Brick and Mortar in San Francisco from a night of energetic avant-rock and jazz. It was a show we have all been looking forward to for quite a while. Surplus 1980 went on first, with a set that combined songs from our recent album Arterial Ends Here with older selections. In addition to Moe! Staiano and myself, the band includes Bill Wolter and Melne Murphy on guitar, Thomas Scandura on drums, and Steve Lew on bass. For this set, we expanded our Fred Frith cover “Cap the Knife” into a full medley featuring excerpts for some of his other songs. In a brief exchange back stage, it sounded like he appreciated the gesture, and even suggested that his group perform a “Moe! Staiano medley”, which would have been fun. 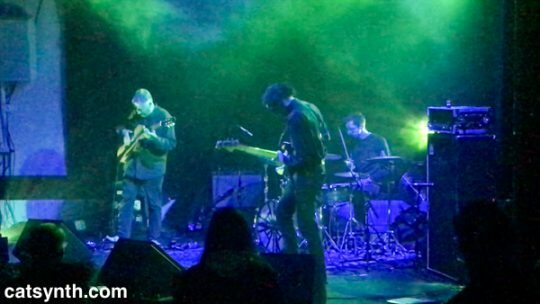 But overall, it was our strongest performance as a band to date, with rhythms and phrasing much tighter as well as more sophisticated use of all parts. After Surplus 1980 was done, Fred Frith took the stage with his trio that included Jordan Glenn on drums and Jason Hoopes on bass. It was quite a contrast, going from post-punk to avant-jazz. The trio played through longer pieces that moved between fast intricate sections and more familiar idioms with ease. The polyphonic sections were certainly impressive, but I do find when technically strong musicians play in unison or at least synchronous rhythms, it leaves a more memorable impression. Frith deftly filled up the otherwise sparse texture of the music, but not so much that one would get lost or overwhelmed. Overall, it was a successful show, with a good turnout. Surplus 1980 is now looking forward to our next show in December, but I hope we get to play with the Fred Frith trio again.